In the wake of four years of economic turmoil around the world and political upheaval in a number of nations, very few people are satisfied with the way things are going in their country. In the 21 countries surveyed, only in China (82%), Germany (53%) and Egypt (53%) do more than half of the population say they are content with their nation’s direction. And, among Egyptians, such sentiment is actually down 12 percentage points from 2011. People are particularly gloomy in Greece (2%), Spain (10%), Italy (11%) and Pakistan (12%). Even in the U.S. only 29% of the public thinks things overall are going well. And the public mood is quite volatile in many societies. 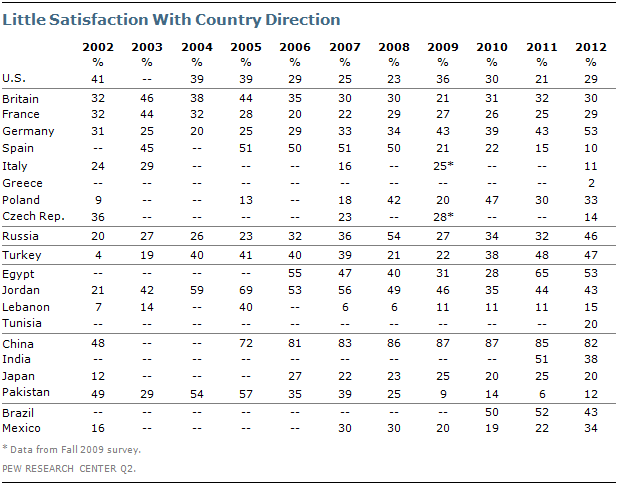 Satisfaction with their countries’ direction is up 14 points in Russia and 10 points in Germany from last year, but down 13 points in India and 9 points in Brazil. Looking further back, since 2007 positive views of the country’s direction have collapsed in Spain (down 41 points) and Pakistan (down 27). But it has improved 20 points in Germany, 15 points in Poland and 10 points in Russia. Notably, only in China have people been relatively positive through most of the last decade. The prolonged global economic slump has depressed the public mood about the economy. In only four of 21 countries surveyed does a majority say their economy is doing well. The assessment is particularly rosy in China (83%) and Germany (73%), but also in Brazil (65%) and Turkey (57%). And it is particularly bad in Greece (2%), Italy (6%), Spain (6%), Japan (7%) and Pakistan (9%). The strongest improvement in public sentiment about the economy since 2011 has been in the U. S., where approval is up 13 points. But still less than a third (31%) of Americans think their economy is doing well. The contrast in public opinion since 2007, immediately before the economic crisis hit, is striking, not only in its magnitude but also because it is a worldwide phenomenon. Confidence in the economy is down 59 percentage points in Spain, 54 points in Britain, 50 points in Pakistan, 26 in Egypt, 19 in the U.S. and 16 in Mexico in the last five years. Bucking this trend is Turkey, where those regarding the economy as good is up 11 points since the year before the crisis and Germany, up 10 points. Looking back over the last decade, only in China among the countries consistently surveyed, has the public been upbeat about the economy for the entire period. The economic sentiment among Germans, Poles, Russians and Turks has been on a roller coaster ride. In only six of the 21 nations surveyed do half or more of the population think national economic conditions will improve over the next 12 months. This includes very optimistic Brazilians (84%), Chinese (83%) and Tunisians (75%) and relatively optimistic Americans (52%), Mexicans (51%) and Egyptians (50%). In addition, a plurality of Indians (45%) and Turks (44%) see a better economy on the horizon. But in six countries majorities or pluralities think economic conditions will worsen, including 81% of Greeks and 60% of Czechs. Among those who think the economy is doing poorly, people in 16 of 21 countries fault their own government, some overwhelmingly so. Particularly angry at their leadership are the Pakistanis (95% blame the government as a primary or secondary culprit), Indians (92%), the Mexicans (91%), the Japanese (91%), the Czechs (91%) and the Poles (90%). Young people in Britain, France, Germany, Spain, Tunisia, Mexico, Brazil and Japan tend to blame the government. And in Britain, France and the Czech Republic, women are more likely than men to blame the government for the economic crisis. Banks and financial institutions were frequently – in Spain (78%), France (74%) and Germany (74%) – seen as the culprit behind the poor performance of national economies. And in two instances – France and Spain – significantly more of the public blamed the banks than blamed the government. There is also significant criticism directed at financial institutions in Jordan (53%) and Egypt (40%). A quarter or more blame the U.S. in Egypt (32%), Pakistan (32%), Jordan (31%), Mexico (30%), Turkey (28%) and China (25%). Meanwhile, the Czechs (39%) and the French (37%) also criticize the European Union. Notably, in seven countries people blame themselves second only to their governments for their current economic troubles. The most self-critical are the Tunisians (68%), the Indians (64%) and the Brazilians (58%).